IGR J11014-6103: Has the Speediest Pulsar Been Found? The fastest moving pulsar may have been found about 23,000 light years from Earth. This object is known as IGR J1104-6103 and may be racing away from a supernova remnant at about 6 million miles per hour. If confirmed, this would challenge theorists to create models that explain such super speeds out of supernova explosions. A trio of telescopes - Chandra, XMM-Newton, and the Parkes radio telescope - was used in this finding. Researchers using three different telescopes — NASA's Chandra X-ray Observatory and ESA's XMM-Newton in space, and the Parkes radio telescope in Australia — may have found the fastest moving pulsar ever seen. The evidence for this potentially record-breaking speed comes, in part, from the features highlighted in this composite image. 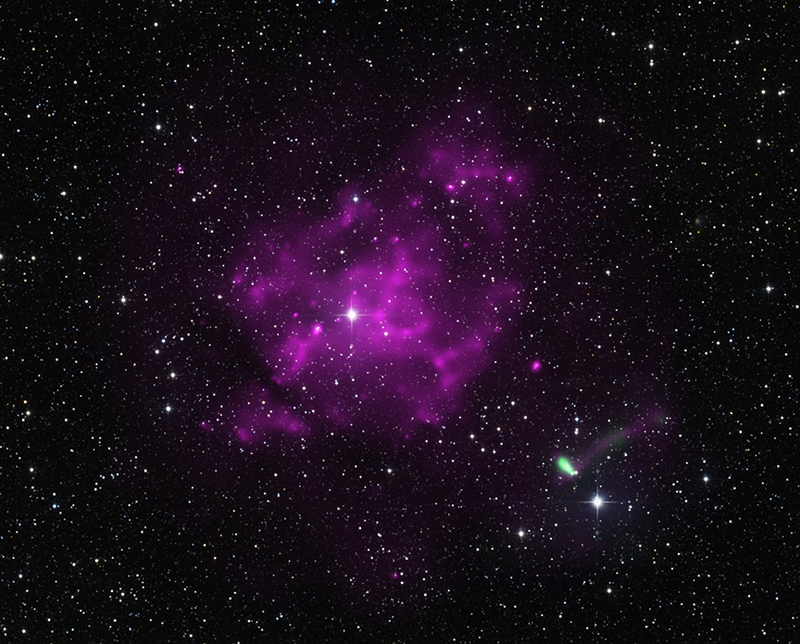 X-ray observations from Chandra (green) and XMM-Newton (purple) have been combined with infrared data from the 2MASS project and optical data from the Digitized Sky Survey (colored red, green and blue, but appearing in the image as white). The large area of diffuse X-rays seen by XMM-Newton was produced when a massive star exploded as a supernova, leaving behind a debris field, or supernova remnant known as SNR MSH 11-16A. Shocks waves from the supernova have heated surrounding gas to several million degrees Kelvin, causing the remnant to glow brightly in X-rays. The Chandra image shown in the inset ("Chandra Close-up") reveals a comet-shaped X-ray source well outside the boundary of the supernova remnant. This source consists of a point-like object with a long tail trailing behind it for about 3 light years. The bright star nearby and also the one in SNR MSH11-16A are both likely to be foreground stars unrelated to the supernova remnant. The point-like X-ray source was discovered by the International Gamma-Ray Astrophysics Laboratory, or INTEGRAL, and is called IGR J11014-6103 (or IGR J11014 for short). It may be a rapidly spinning, super-dense star (known as a "pulsar", a type of neutron star) that was ejected during the explosion. If so, it is racing away from the center of the supernova remnant at millions of miles per hour. The favored interpretation for the tail of X-ray emission is that a pulsar wind nebula, that is, a "wind" of high-energy particles produced by the pulsar, has been swept behind a bow shock created by the pulsar's high speed. (A similar case was seen in another object known as PSR B1957+20 . 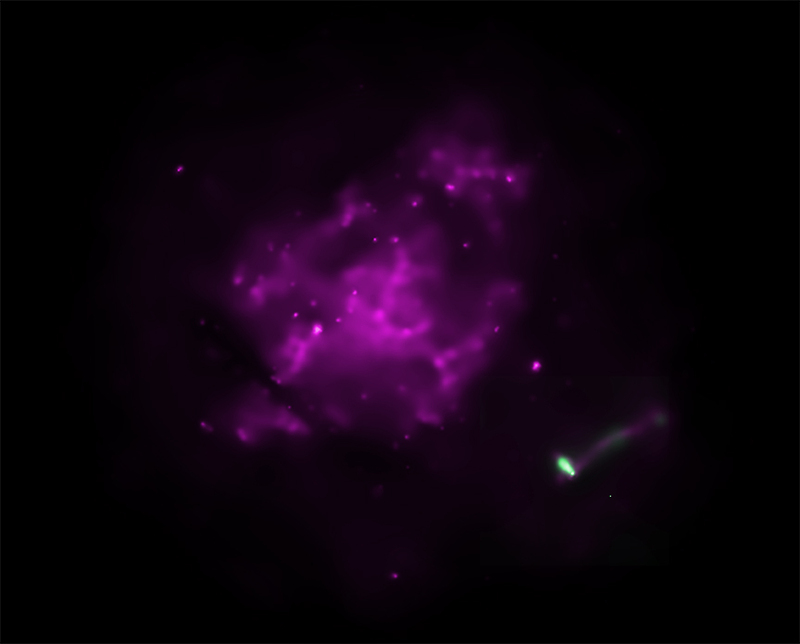 The elongated emission is pointing towards the center of MSH 11-16A where the pulsar would have been formed, supporting the idea that the Chandra image is of a pulsar wind nebula and its bow shock. Another interesting feature of the Chandra image, also seen with XMM-Newton, is the faint X-ray tail extending to the top-right. The cause of this feature is unknown, but similar tails have been seen from other pulsars that also do not line up with the pulsar's direction of motion. Based on earlier observations, astronomers estimate that the age of MSH 11-16A, as it appears in the image, is approximately 15,000 years, and it lies at a distance of about 23,000 light years away from Earth. Combining these values with the distance that the pulsar has appeared to have traveled from the center of the MSH 11-16A, astronomers estimate that IGR J11014 is moving at a speed between 5.4 million and 6.5 million miles per hour. The only other neutron star associated with a supernova remnant that may rival this in speed is the candidate found in the supernova remnant known as G350.1-0.3. The speed of the neutron star candidate in this system is estimated to lie between 3 and 6 million miles per hour. The high speeds estimated for both IGR J11014 and the neutron star candidate in G350.1-0.3 are preliminary and need to be confirmed. If they are confirmed, explaining the high speeds of the neutron star presents a severe challenge to existing models for supernova explosions. One important caveat in the conclusion that IGR J11014 may be the fastest moving pulsar is that pulsations have not been detected in it during a search with the Commonwealth Scientific and Industrial Research Organization (CSIRO) Parkes radio telescope. This non-detection is not surprising for a pulsar located about 23,000 light years away. However, there are other pieces of evidence that support the pulsar interpretation. First, the lack of detection of a counterpart to the X-ray source in optical or infrared images supports the idea that it is a pulsar, since such objects are very faint at these wavelengths. Also, there are no apparent differences in the brightness of the source between XMM-Newton observations in 2003 and the Chandra observations in 2011, behavior that is expected if IGR J11014 is a pulsar. Finally, the X-ray spectrum of the source, that is, its signature in energy, is similar to what astronomers expect to see for a pulsar. These results were published in the May 10, 2012 issue of The Astrophysical Journal Letters. The authors were John Tomsick and Arash Bodaghee (University of California, Berkeley), Jerome Rodriguez and Sylvain Chaty (University of Paris, CEA Saclay), Fernando Camilo (Columbia University), Francesca Fornasini (UC Berkeley), and Farhid Rahoui (Harvard-Smithsonian Center for Astrophysics). Coordinates (J2000) RA 11h 01m 22.08s | Dec -61° 03´ 25.20"
Observation Time 1 hours 23 min. Quite a few typos here even MSH 11-16A is called MSH 11-61A like once. Find out why and what makes spin work and you will solve many mysteries of space. This is a very colourful image. All thanks to Chandra X-ray and NASA and ESA. Good luck with your mission Chandra! If the age of the object is 15,000 years, but it lies 30,000 light years from us... then how could we possibly be seeing it now? Wow, that's one amazing image from the craft. I've learned only a little bit about pulsars but am not a professional astronomer. Am just a beginner but wish I had the brains to understand or learn more. I'm so glad this was found via Twitter. It's a wonderful thing you are doing. Keep up the fantastic work. I love this line of astronomy as much as I love deep space astronomy. A pulsar found racing away from a supernova remnant about 15,000 light years from Earth. X-rays from Chandra & XMM with Optical data from DSS and IR from 2MASS. Image is 1 degree across (~576 light years). X-ray-Chandra: (Green) X-ray-XMM: (Purple); Optical (Red, Green, Blue).